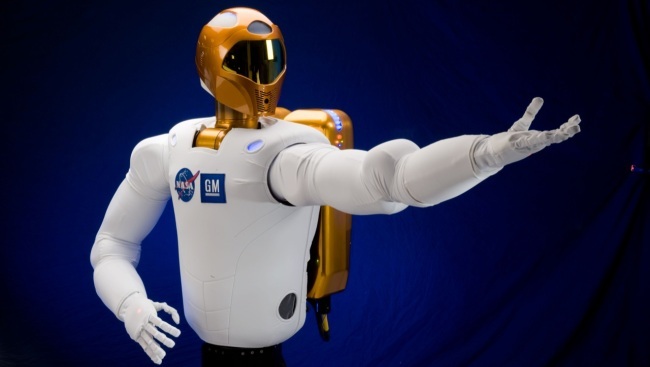 NASA and GM have finished the Robonaut 2, a robot designed to assist astronauts on the International Space Station. It will launch Nov. 1. Robonaut 2, or R2, is packed and ready to launch into space aboard the space shuttle Discovery on Nov. 1. The humanoid robot, or android, will assist astronauts aboard the International Space Station. It is not known precisely what tasks R2 will perform, but it is designed with “advanced control, sensor, and vision technologies.” Sounds useful enough. The robot is a collaboration between NASA and General Motors, which began in 2007. Workers from NASA and GM spent the last few years at the Johnson Space Center in Houston building the robot. GM believes that the advancements made in sensor capabilities will help the company improve safety in future vehicles. Already, several GM vehicles offer crash avoidance features that use sensors to warn of incoming danger and help drivers parallel park. In addition, some of the advancements in robotic hand dexterity could help GM design better manufacturing plants. The original Robonaut was built by NASA and DARPA about ten years ago, and designed for space travel. NASA and GM have been working together since the 1960s, when the two collaborated on navigation systems for the original Apollo missions. GM helped develop the Lunar Rover. Though strange looking, Robonaut 2 is undoubtedly a more constructive use of advanced technology than this pleasurable robot.